You are currently browsing the tag archive for the ‘NC 226A motorcycle road’ tag. Just back from my annual motocamping trip with Ernie and Al, and one of the roads we wanted to ride this year was NC 226A, also known as “The Diamondback”, which runs from Marion, NC to the Little Switzerland Inn on the Blue Ridge Parkway. Last year when we had dinner at Little Switzerland late in the day, we noticed that they are trying to merchandise this road and capitalize on the motorcycle traffic that visits that area of North Carolina to ride the Blue Ridge Parkway and the Dragon’s Tail. We never seem to have enough time on these trips to make it down to the Dragon (part of that is the leisurely pace and frequent breaks that mark rides led by Al) so we made a mental note to ride “The Diamondback” when we returned to the region this year. From what we read of it at Little Switzerland, it sounded like a reasonable alternative to the Dragon, boasting 190 curves in 12 miles, compared to the Dragon’s 318 curves in 11 miles. Let me make this clear. Save yourself the trouble. There are a lot of reasons to go to Little Switzerland – the prime rib, which is one of the finest I’ve tasted, is one. The Blue Ridge Parkway itself is another. The breathtaking views and local charm of the mountain town, still others. But NC 226A is not worth the trip. In fact, I would avoid it, period. The problem is that for every one of those 190 curves, there are dozens of tar snakes which wreak havoc with your selection of a path through the curve. 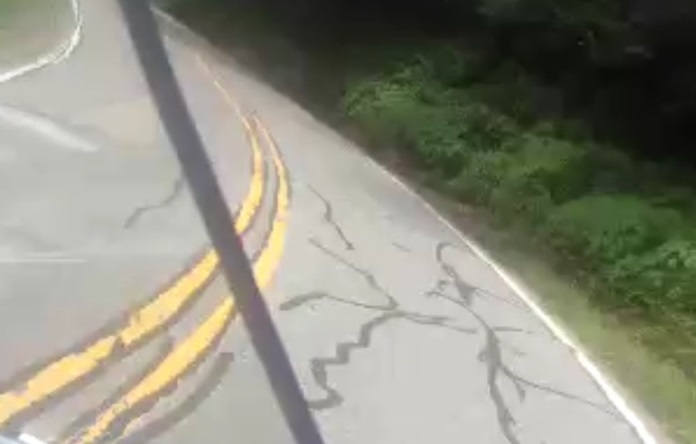 If you hit the tar snakes the wrong way, it sends your front wheel skittering sideways, with the potential to take you and your bike off the road. Tar snakes on NC 226A. With that we carefully U-turned and made our way back up the road, and onto the Blue Ridge Parkway. That little exchange spawned a catchphrase that will probably ride with us for the balance of our days: “I have zero desire to ride this road.” We laughed together and repeated that phrase a number of times throughout our trip. So the brief descent down 226A wasn’t a total loss because we’ll be telling stories about that crappy road for years to come. Had I skidded off the road, it would have likely ended my vacation and led to a world of hassle. In the middle of the mountains, far from a Triumph dealer with the parts to fix the bike, and a deadline to be home within a few days. At best! At worst, dealing with injuries, maybe even life threatening ones. To me, NC 226A is a road that you don’t merchandise to capitalize on tourist trade. Let the bikers enjoy their stay in your village while they continue down the Blue Ridge Parkway. But don’t tempt them to get sidetracked on an unsafe and poorly maintained road. To tout the merits of your road is, at best, false advertising and at worst, downright negligent. It’s a trend that seems to be taking on, this business of naming motorcycle roads. In fact Backroads Magazine did a brief article about the trend in the May issue. But after riding “The Diamondback” it reminded me a bit of the trend to name holes on golf courses, which started with Augusta and its colorfully-named holes like “Firethorn” and “Redbud”. But I knew the trend had gone too far when a dogpatch muni near my hometown named it’s holes. That’s what riding The Diamondback was like. Don’t waste your time, until, as Al said, they repave the road. Don’t take my word for it though. Here’s a video I created documenting the aborted trip down The Diamondback.